The complex morphology of the Western Himalayas has favoured quite a number of dynamic interactions with their bordering countries (present day U-tsang and Chang-thang in the TAR, Nepal, Himachal Pradesh, Jammu-Kashmir, North Pakistan and beyond) that is here followed through the study of iconographic elements in the coinage of Nezak Shah (Pﬁsterer and Uhlir) or portable cult objects from Khotan (Forte), items that, like manuscripts (Tauscher), often travelled over long distances. Like art-historical evidence surviving in Lahul (Widorn), they help to trace Buddhist pilgrimage routes and recover religious maps. The consideration of the historical, cultural and social background of the Buddhist sculptures in ancient Uḍḍiyāna, where Indian motifs interlace with local elements (Filigenzi), gives yet another view of such a landscape. 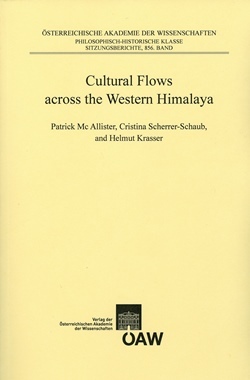 The theme of “Tibetan Himalaya Style” in the art of the Western domains, thoroughly analysed in the larger context of the surrounding regions and in consideration of an impressive number of artistic productions, contributes to a social history of these regions (Klimburg-Salter). The role of Kashmir as a privileged centre of learning, particularly during the last centuries of the ﬁrst millennium CE and the following two centuries, is here investigated through the work and life of the philosopher Śaṅkaranandana (Eltschinger), the Buddhist theory of universals (McAllister), the practices of translating Buddhist texts (MacDonald), and the aesthetic theory discussed by Śaiva and Buddhist philosophers (Mukherji). The intellectual life is also viewed through practices related to the written, e. g., the use of palimpsests on inscribed murals in Zhalu (Tropper and Scherrer-Schaub). Besides micro-historical data about the founder of the Guge-Purang dynasty in Western Tibet, Ye śes ’od, gathered from a recently discovered manuscript (Samten Karmay), and a ﬁrst-hand account of the culture and religious practices of modern Dolpo (Phuntshog Nyima), three ritual texts for summoning good fortune are analysed by studying the role of the deer as a structuring principle in Bon po rituals (Ramble). Finally, new methodological approaches are presented in an introduction to the use of new technology to map history (Cartwright), the project of an on-line cartographic information system elaborated at the University of Vienna (Pucher and Kriz), and the use of a GPS data acquisition tool (Schobesberger), followed by the example of the 3D visualization of the temple complex at Nako, Kinnaur (Nausner and Schobesberger).